Continuing with Part 2 of Project X. This software gets high marks for versatility (AD&D 2nd, 3rd and 3.5 edition to name but a few). A solid interface and a slew of components. 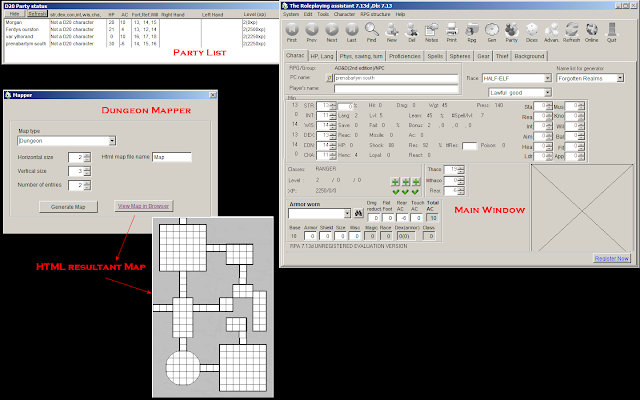 Highlights include a random dungeon generator (no room descriptions), Name generator (with list for family), large randomizer that you can choose what you need - i.e., treasure, city name, player trait, background etc. Overall, truth be told, I rarely use it due to other small programs that already handle dungeon and name generation. 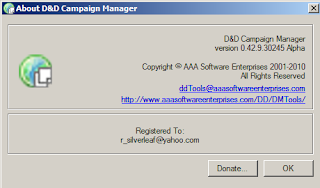 I'm hopeful that 1E support is forthcoming, however, if activity on the forums is any indication (last thread was dated Jan 23, 2010) this package COULD be inactive. One of the newer packages to come along, this program is a full screen behemoth, with a ton of data - broken down with the "group" on the left, and player/monster on the right. 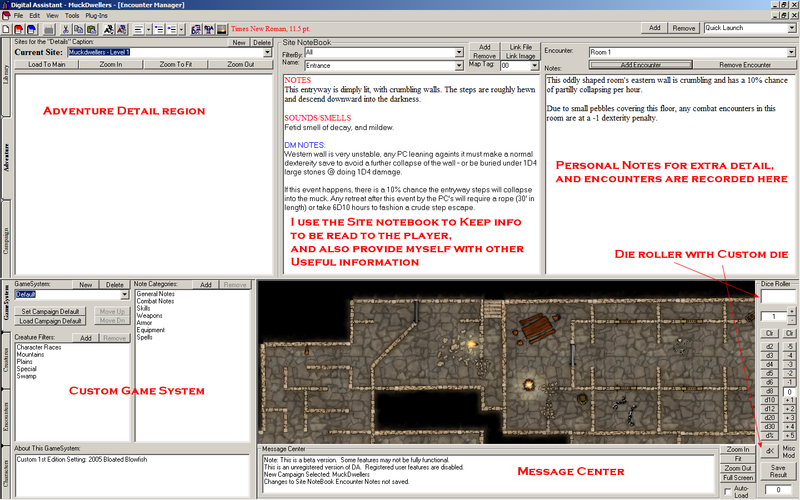 Independent icons open up the campaign/monster-player creator/dice roller and also show monster stats. 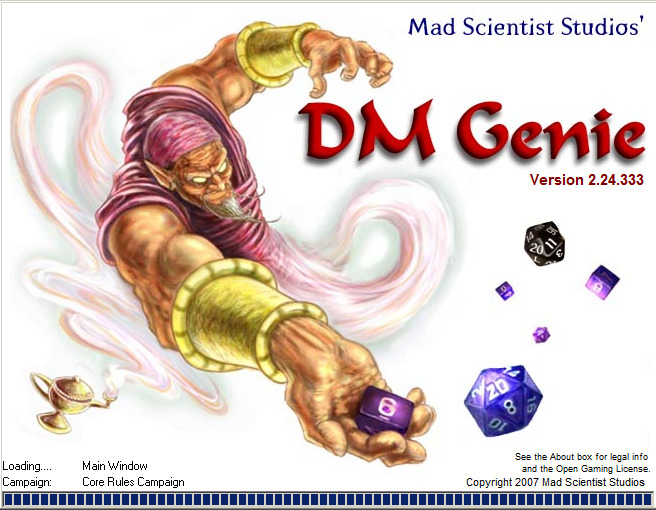 3.5 is the main core that DM Genie supports, but the top seller for me is the Campaign Section which has HTML creatable links within the text proper. 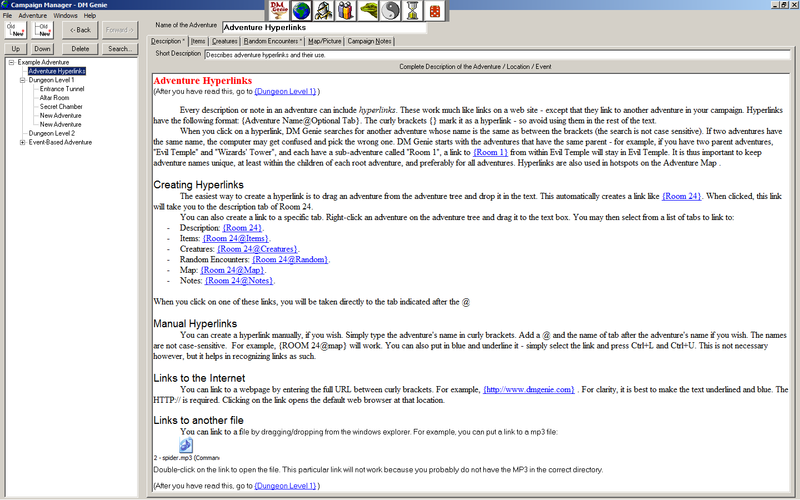 Overall, while I like the layout, the bulkiness of the package leaves me desiring a smaller GUI. 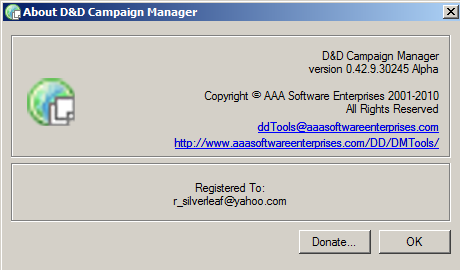 D&D Campaign Manager, like many of the previous mentioned programs, has a large variety of solid features. What sets D&DCM apart from most is the ability to custom pick exactly what "books" and "rules" system you wish to use. 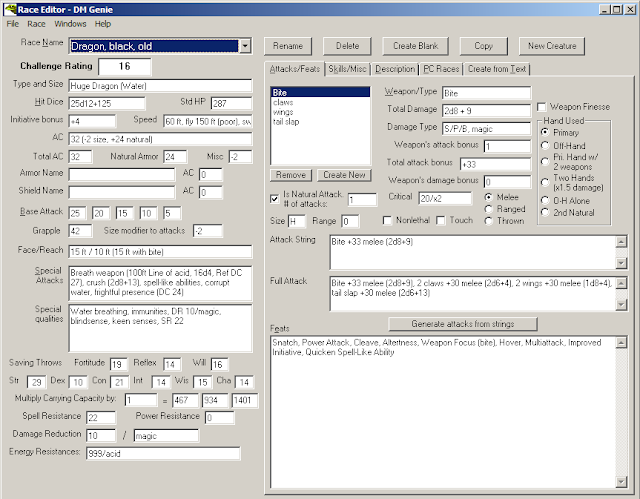 To further expand on this cusomization, you can also choose specific items for your campaign - like Die rolling method for PC creation, and even mundane items like how initiative is rolled. 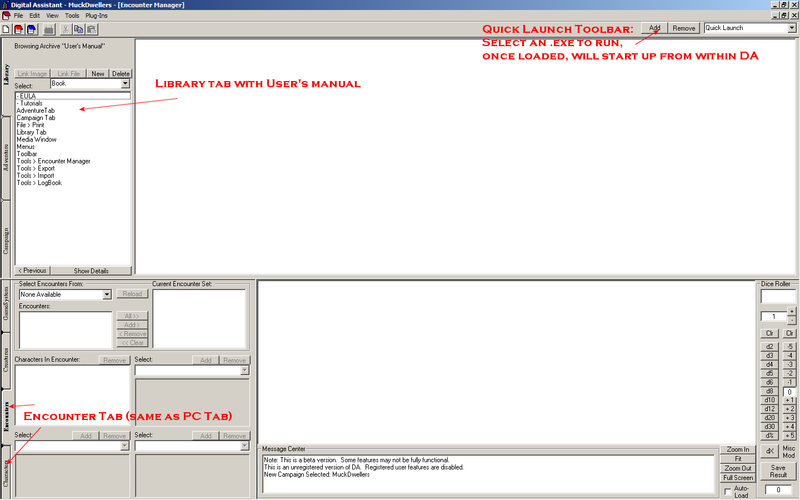 As a bonus, I like the fact that the interface allows you to have multiple "windows" open for quick access to a multitude of info. 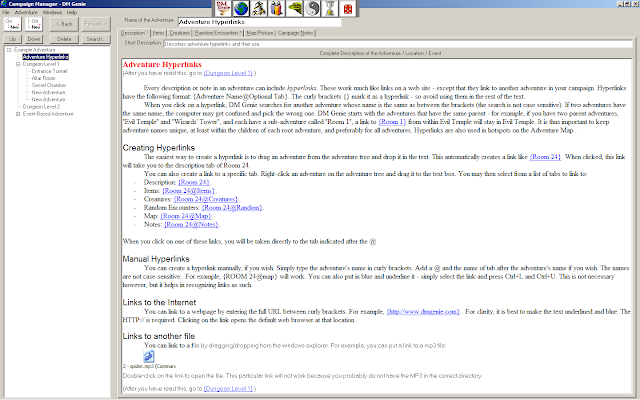 This is handled with a tabbed interface, so having multiple tabs open at the same time makes switching easy and simple. 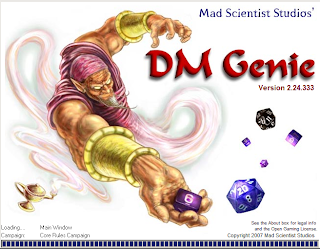 3.5 is the main foundation of D&DCM, but it remains one of my favorite packages because of the custom setups available, and that you can quickly find what you need. 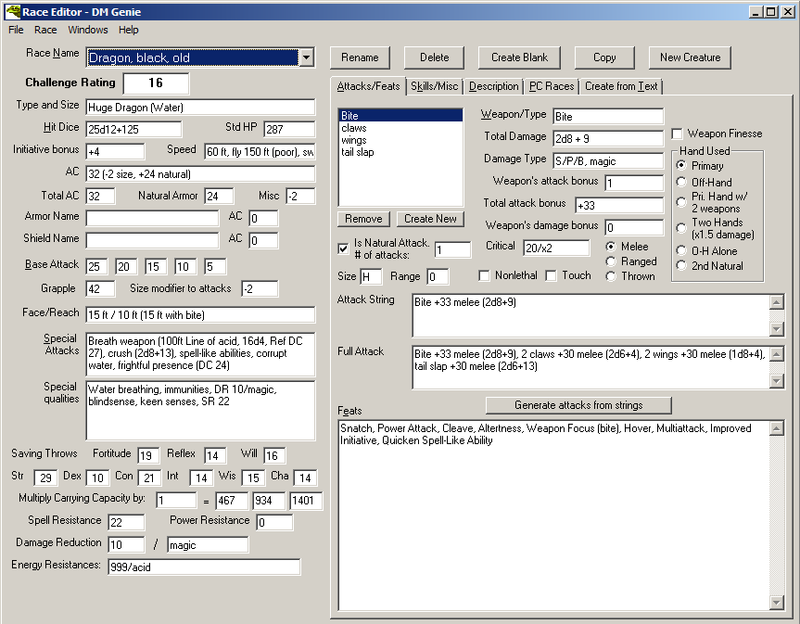 Only thing I don't see at this point is the flexibility to switch to 1E monsters given all I found were of the newer versions available. If this oversite could be addressed D&DCM could easily fill my gaming needs. Talk about a solid software package, Digital Assistant (DA for short) fits the bill. 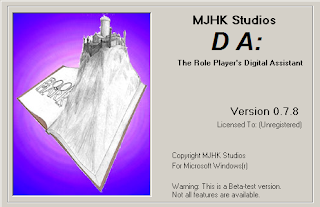 To make it clear, DA isn't specifically designed to support JUST AD&D, but rather is for RPG's in general. Tabs run along the left side of the screen, and it is here where you will fill in your details for Campaign, PC and Setting. 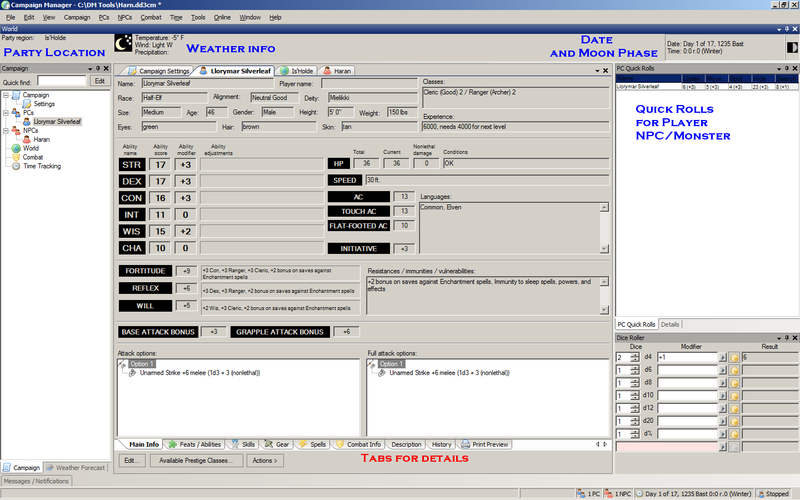 Individual images can be loaded in on each of these sections, and then loaded into the view window at the bottom of the main interface. 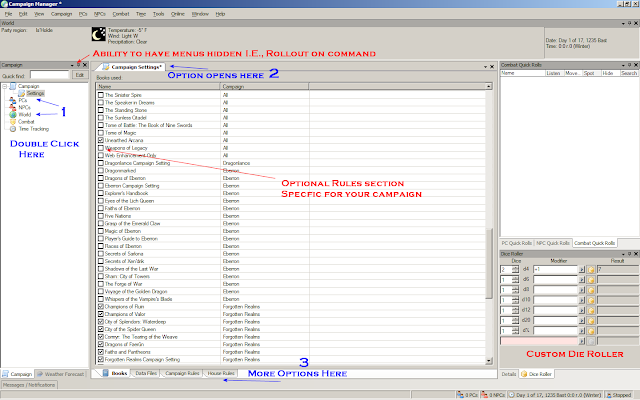 Click on Encounter Manager, and a seperate area becomes available for special interest. 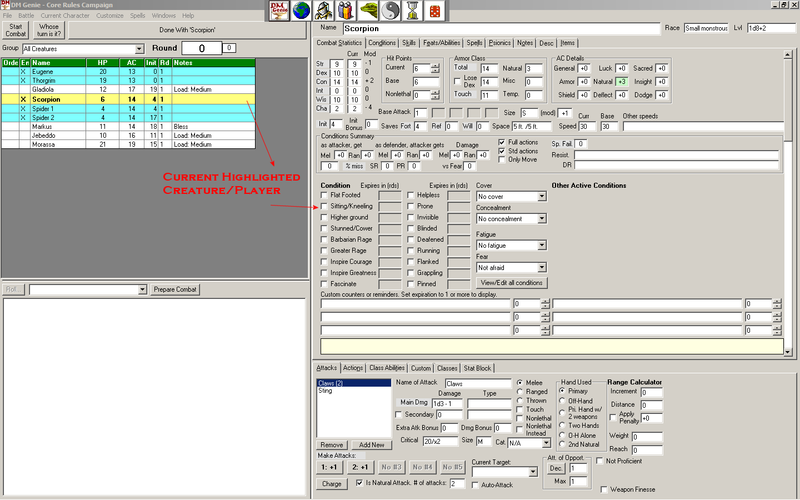 NPC/PC/Creature and Game System stats/info can be entered here. The Game System is of special note because you can customize this to your own world. While it doesn't cover the amount of books and rules that D&DCM has to choose, this does allow flexibility to the DM. 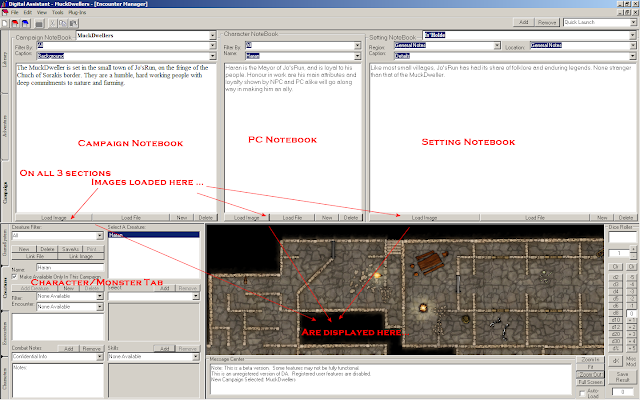 The Adventure tab has special places to enter in images, Notes to be read to the player and even DM info - the point of this entire program is that you can set it up to fit your world, i.e., CUSTOMIZE is the key word of this software and it shows that a great deal of thought went into the creation of it. As a bonus, and on my own personal list, is the Quick Launch Toolbar - which means you can choose that favorite Tavern or Random Generator .exe and set a shortcut to it and voila - it will indeed open from within DA. Add in a solid die roller (with custom die creation), and the package is complete. So after all of this, there is a Caveat. 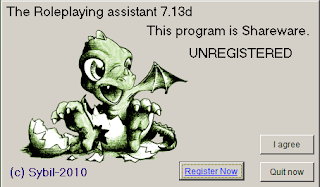 This software is Beta, and was never finished/finished version released. It runs extremely well on my Vista system, and I've had no crashes. Note to prospective users. There is no save feature. BUT DA DOES save your info as you fill it in.